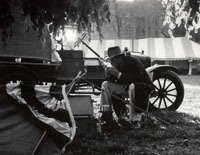 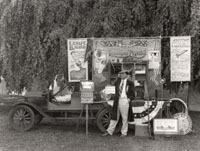 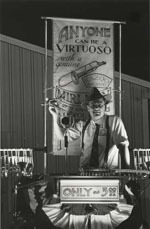 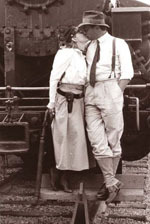 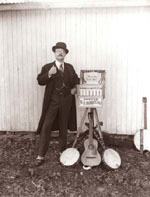 Mark Osterman ran a well-known traveling medicine show from a folding stage built on the back of a 1919 Model T Ford for twenty years. 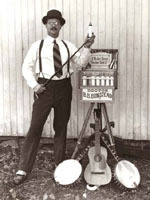 Dr. Bumstead's Celebrated Lenape Liquid Show sold an elixir called Lenape Liquid and musical instruments (Kazoos and Humanatone Nose Flutes) using the spectacular rhetorical and musical talents of the celebrated Dr. Bumstead (Mark Osterman), trick shooting by K.T. 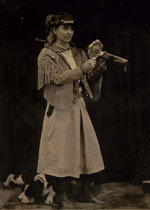 Oakley (France Scully Osterman), and an Indian named Screaming Weasel (played by ten different people over twenty years). 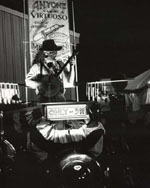 Mark Osterman worked out of the Philadelphia area and performed throughout the Pennsylvania, New Jersey, Maryland, and Delaware region. 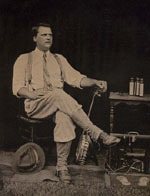 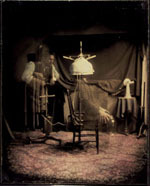 Mark Osterman contacted Dr. Wilson through this web site because of our mutual interest in traveling medicine shows; together we have assembled these photographs and stories.